We've all heard the rule of thumb... 10 grains of arrow weight per pound of draw weight gives good penetration. So, other than trajectory, is there a down side to more grains per pound? My setup is like 12.2 grains per pound. Well, 10 gpp in a 30# bow is not going to be very good in the penetration dept. OTOH, 8 gpp in an 80# bow ought to excel at penetration. We really need a whole different way of measuring or anticipating penetration potential. well....there is a point of diminishing returns. Rick Barbee has done, and posted a LOT of information o this subject in the past year. There comes a point where the increase in weight slows the speed enough to either show no gain in penetration, or to in extreme instaces actually impede penetration. Ok then. About 44 pounds draw and about 530 grains arrow weight. Manageable trajectory out to 25 yards then drops. 25 is about my Max this year anyway. To find out for yourself. just try some penetration tests. Really doesn't matter what the medium is. The arrow that penetrates the deepest in dirt will penetrate the deepest in flesh. Try some different weights and see what you find. Tha's the best way to decide. Manageable trajectory is usually self imposed. Changing anchor on your face will give you more sight picture and let you shoot further. Heavier arrows doesn't mean you are limited in distance. And yes....there is a point of diminishing returns...some common sense helps in that aspect as well. A straight flying arrow means a lot more than even 100 grains of weight when penetration is what you are after. If your arrow flys good and you can hit your target the rest really isn’t important. Just about any non ultra light shaft with a 125 grain or more point is more than sufficient out of any legal draw weight bow. At bow hunting distances it's probably not going to make much of a difference in trajectory or penetration. Most anything under 400 grains total weight with a broadhead is a soda straw arrow anyway. I think Dkincaid hit it on the head. I think we make it to complicated sometimes. If your arrows are flying good, you can hit with them and get good penetration, why worry about it. 62 years ago before carbons, I was using a shaft that was no way what I should had been using. However they flew great. I guess I'm from the old timers school. When I buy shafts and fletch them up, I want THAT shaft to fly good. Not concerned with FOC, extra point or nock weight. I might have to work to find THAT shaft but when I do, I've got it. Some of the good company's, like 3 Rivers, offer test shafts that would help a person a lot. Just my opinion. No, the more momentum it has, the better. Momentum is resistance to delta-vee. Read a lot about the 10 grains per pound on here and other forums where 9 to 10 is mentioned, but with state legal draw weights, for deer hunting, bet your 12.2 grains per pound will kill'em just as dead. I don't equate that measure to good penetration, I equate that to enough arrow weight to keep the bow quiet and give good performance and not damage the bow! I feel the lighter you go, the heavier the gpp should be within reason. Hmmmmm. Seems most of the threads I see speak of the gpp number in relation to arrow trajectory, not penetration, though the two are certainly related. Has little value as a penetration predictor. For example, An 8 gpp arrow out of a 40# bow should fly about the same (i.e. have the same trajectory, at least at moderate ranges)as an 8 gpp arrow out of an 80#, but it certainly won't penetrate as well as the latter. BTW, the 9-10 grains per pound rule of thumb came about as a de facto measurement of what folks were shooting back in the day. A cedar arrow with a commonly used 125 grain point just happened to come out to about 9-10 grains per pound of bow weight. Has become a generally accepted rule. Nothing wrong with that. 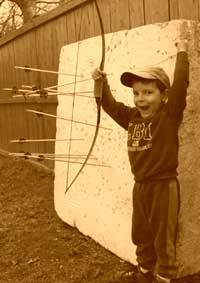 It still works for matching an arrow to a bow to achieve adequate arrow flight/trajectory. No real rule since we can do what pleases us, however arrows under 8gpp are likely to damage the bow sooner or later. The 10gpp is what I stick to because it's not too light and not too heavy and this way if I pick up a 50lb bow or a 70lb bow at 10gpp I can see the same trajectory.. or close enough that my mental computer can't tell. I mostly pick that weight because it makes a bow quieter with less vibration. with my draw length and poundage choices, I don't need penetration help. Now the 10gpp is +- whatever it takes to get a great flying arrow and I beleive that anybody shooting 35lbs or more will do fine with 10gpp unless hunting larger than deer sized animals. Just curious, how many people have experienced inadequate penetration with a hunting weight bow? Let's exclude hitting large bones that will stop just about any arrow or cape buffalo. That's the fallacy of these repeated discussions. Can't say that I ever have, but I've always shot arrows in the 550-650 grain range out of 50-65# bows. Again, I look at gpp as a figure to consider in determining what arrow weight will give good arrow trajectory. I don't use it as a guide for penetration. The factor that most over look is velocity loss at the target. Arrows begin loosing velocity the second they leave the bow, and Physics tell us the a heavier arrow will maintain its velocity longer than a light arrow, because of friction in the air, and those figures will vary not only from arrow weight but fletching size, shape and amount of offset or helical and how quick the arrow recovers from paradox. What needs to be established is an arrow weight for a given bow weight and I sure those figures will vary considerable depending of the factors listed, not just grains/pound. No cape buffalo, only white tail. Good discussion. Thanks to all. If you're getting good arrow flight... wonder on this matter no more. If you're going to error... my thoughts are to "error heavy." 12 gpi is great. Quieter... less stress on your bow... more penetration... happy hunting. I believe that 12gpp will give you less penetration than 10gpp. "The factor that most over look is velocity loss at the target." I will take this in consideration for 70m and above shooting. At 20 yards the difference is insignificant unless the arrows are feathers. Guys - Just curious, how many people have experienced inadequate penetration with a hunting weight bow? Let's exclude hitting large bones that will stop just about any arrow or cape buffalo. Viper, based on the "common knowledge" 400gr arrow is enough to kill a deer using a #40 pound bow. This means that a 400gr arrow should be enough for any bow above #40 to kill a deer. 400gr shot at 160 fps from a #40 bow will have less penetration than a 400gr arrow shot from a #50 bow of same maker, even if some are saying speed doesn't count. I'm using a 35 pound hybrid longbow and 450 gr. Arrows. I got a new 3D target and it's hard to pull those arrows. With a sharp broadhead i wouldn't be surprised if I get a pass through on a deer. It sure helps when you get near perfect arrow flight. It's shoots flat out to 20 yards but drops pretty fast after that. The 10gpp is better for bows over 40 pounds, you have to go higher gpp if your using a bow under 40 pounds. Based on the text, anything below #60 is not good for hunting deer. And the 10gpp is more related to misses management than penetration. True but still we are talking in same parameters. Wondering why he did not compared same arrow different bows. In those times they were not limiting the shots to 20yards and a 600gr arrow needs altitude to make it to 40-60yards when shot from a #45 bow. If that were true, an arrow at rest would be capable of blasting a hole through a bank vault. Any given bow stores a certain amount of energy. You can use that to throw a light arrow faster or a heavy arrow slower, and the kinetic energy value won’t change very much at all. And if you prefer to look at Momentum, rather than KE, just remember that the equation is M*V, straight up. Neither one is more valuable than the other. The bow can only do what it can do, so increasing mass is going to cost you speed, and there’s no way to pick up speed without giving up some mass. But it doesn’t really matter because while the energy output isn’t fixed at exactly one value, messing with your GPP isn’t going to change it but a small fraction. Not within the normal GPP range, anyway. Rick Barbee has tested it much more than most, and he’s pretty well settled on 9 GPP, I think. Right in the middle of Normal. JMO, if you want better penetration than you can get from your bow at 8-11 GPP, you can always improve your tuning and try an upgraded string, but if that doesn’t cut it, you need to draw more pounds or switch to a more efficient bow design. I like to shoot around 10 to 11 gpp. I do believe a well tuned arrow flying straight into the target gives better penetration than an arrow flyng wobbly into a target. Years ago there was an article in the NFAA magazine written by a friend, Doctor Kenagy. He described how a fellow hunting at Nason Creek in Washington State was coming back to camp and saw a buck on an opposite ridge. The man thought to himself, "why carry all these arrows all the way to camp?" and proceeded to lob a couple of arrows towards the deer. One arrow, falling by gravity alone, struck the buck midframe and cut through the spine and spinal cord, dropping him in his tracks. No momentum from the bow, just the free fall second per second of gravity on an arrow tipped with a sharp broadhead. Kenagy hired a surveyor to measure the shot and elevation change. I really do not remember those figures. Point is, it takes little effort to cut through flesh and some bone with a thin sharp object. Just put all the math and theory behind you and use a bow of legal weight shooting an arrow whose trajectory is comfortable for YOU to shoot, and go kill animals. If you want to check out how physics applies to arrows, just take two arrows, one weighing 550 grains and one weighing 450 grains, and shoot them at a near 45 degree angle and see which one goes further. I went and shot today 450gr and 590gr with my BF Ex on 19" Satori riser set to #51.4@28" my draw length. Since these are averages I can say the ballpark is in 16 fps loss for both arrows at 20 yards. These are my results based on my 3 under release and @51.4@28” bow. One arrow is 9gpp the other is 11.5 gpp. It makes me to say that I don’t buy the heavier arrow has better velocity than a lighter arrow for 20 yards. Taking in consideration the real numbers from this set-up, will be hard for someone to convince me "heavier is better". I think that 9 - 10 max gpp is the perfect mix of speed, trajectory and hitting a wary target. Draven, how did the fletch sizes and shaft sizes of the two arrows compare. Good shot hitting the chrono sweet spot at 20 yards. The 450gr is 31" shaft with 5" fletching. The 590gr is 30" shaft with 4" fletching. But since it has an additional 80gr insert, the somewhat POB is very close to 31". Both are flying like darts from the bow. One is visible slower, but still flying perfect. What's the source for the text you shared? If #30 is legal for elk, knock yourself out. Or you think poaching? Oh, it's not legal, but if I'm going to to ignore natural law, why pay any attention to man made laws? Natural law is called common sense. You can bend it until it hits you, but it looks like sometimes man made laws are necessary for some. So does the heavier arroe penetrate more than the lighter arrow or not? If you will scroll up to the second post in this topic and give some thought to it you will see what I'm getting at. If you have disagreement with that, I'm perfectly ok with that. OTOH, you might agree that a simple answer of 10 GPP is not a complete answer to the OP's original post. Well Longcruise I think that was pretty funny! From my experience shooting a lot of 3D back in the 90's the nastiest arrows on the course for penetration was a damn A.C.E. Those black darning needles went very deep into the foam no matter what they were shot out of. They were no where close to 10gpp. Could you put a dead head on it and hit anything, nope. In discussions with some of my fellow bowyers over the past couple of years on this 10gpp IMHO. It has been mostly used as a way to test a bows performance at a given draw weight. I believe it was also used in WTW. It gave a standard arrow weight per pound.